Raincoat for dog. Dog Raincoat. Italian Greyhound Clothes. 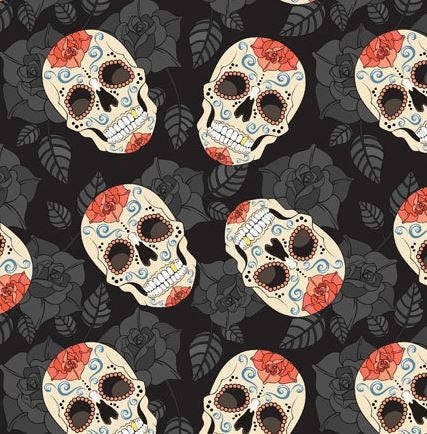 Candy Skulls. Dog coat. Coat for Italian Greyhound. Dog Clothes. Dog apparel. Roo-ing in the rain! 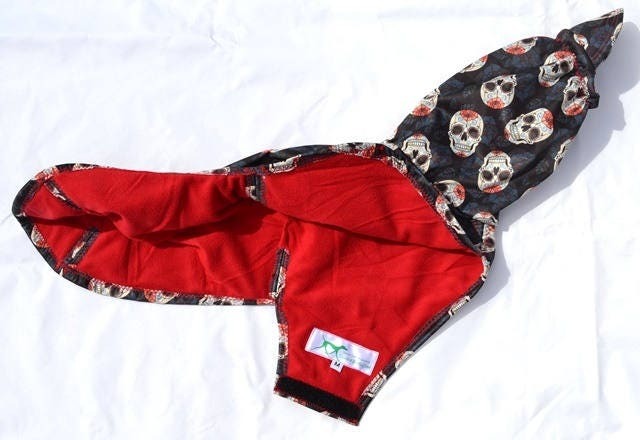 Only 1 available - a limited edition Candy Skulls Raincoat. Macaroni (pictured) is our International Stylist Expert – a Canadian dude who loves a manly man's wardrobe. 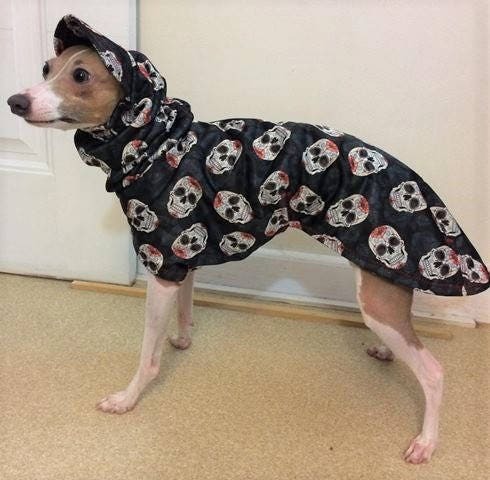 He is modeling the "Candy Skulls" raincoat which features a hoodie with a cute as can be visor. Closure is an adjustable Velcro belly strap. Darted in all the right places for a sleek fit. Perfect for keeping your hound dry on those rainy days. Made out of PUL (Polyurethane Laminate) fabric which is water proof and breathable. It is lined with a very light-weight micro-fleece. Care Instructions: Close Velcro. Machine wash cold / tumble dry on cool. Do not iron. Do not dry clean. No bleach, vinegar, or oxy-type products.